Shelley doesn't believe him but decides to go along with the delusion and hops on a plane with him. Along the way, she tells Paolo how she met Max when she signed up for his European tour. Together they realize that the strange history lessons he gave with the tour were his own personal recollections of his past lives. As Shelley shares his stories they get a better sense of the man he really was. 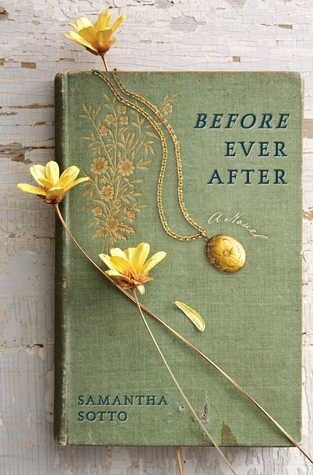 I didn't have a problem suspending disbelief for Before Ever After by Samantha Sotto. That was the easy part for me. How I felt about Shelley and Max, however, is a different story. I never really bought into their everlasting love. For me, Max was a more interesting person in his previous incarnations. Modern Max was just a guy obsessed by chickens. I know that's weird because they are the same person but that's how it was for me. As for their love, all I saw was a guy who talked too much and a girl who did very little. I guess they were in love because they were in love and I was supposed to just get that. My feelings for Max and Shelley have a great impact on my feelings for the ending. The ending. I have this friend who adores love songs while I hear one and think, 'Barf.' The way I look at it, depending on whether you are like my friend or like me will determine how you feel about the end. I was hoping it was going in another direction, but it went where it did and I can't decide how I feel about it. It's either romantic or really messed up. I'm leaning toward messed up, not Black Swan messed up, but messed up. I'm a swan, not a chicken. BUT. I absolutely loved those stories of the past. I couldn't get enough of them. When one story ended, I couldn't wait for the next one. It was in these stories that Max's personality really came through. Samantha Sotto creates such a vivid sense of place and time. If she ever publishes an honest to goodness historical novel, I am there. She needs to work on those metaphors though (I was sure that elephant was real). So, the romantic elements didn't work for me but the historical ones did. Advance copy from Crown Publishing Group via Shelfawareness. Thanks. OK, the Black Swan caption made me cackle. My class is wondering what on earth I'm doing. :D Great review. This one sounds weird. Honestly, this doesn't really sound like my type of book, I mean, when there is LOVE and ROMANCE I have to know why the characters are in love, not just a they are in love because they are in love, that's it. Also, I need to watch Black Swan and this review reminded me of that. I must say the historical aspects of this book interest me, but not the romance aspects. So, I don't think this would work for me sadly. I'm not big on romances, but you've got me very curious about the ending. Andi- It's okay, they'll just think you're crazy. April- Yeah, and Shelley spends a lot of time saying how much she doesn't want to get married. Kelly- Maybe not but it's short if you want to try it. Kathy- If you do read it, I'd be interested in what you make of it. Sounds interesting, but it also seems like it may be a little confusing to keep up with all his incarnations.